On re-entering society, formerly incarcerated people struggle to get health care and treatment for HIV. When people living with HIV walk out of prison, they leave with up to a month's worth of HIV medication in their pockets. What they don't necessarily leave with is access to health care or the services that will keep them healthy in the long term. That is one of the findings of a study published Tuesday in PLoS Medicine. The study was among the first to follow people with HIV from jail or prison back into the community. What they found was that most people — more than half — fell out of care within three years of leaving prison. But those who did stay in care did well — better than those who returned to prison. They were more likely to have access to health insurance and intensive case management that connected them to support groups, housing, medical care and other services. The fact that so few had that experience points out how the health care system fails this population, says Dr. Frederick Altice, director of Yale's HIV and Prisons program and the study's co-author. In some states, prisoners are re-enrolled in Medicaid before they're released. In others, it can take weeks or longer. "[HIV] is a chronic disease," says Altice, who has been treating people with HIV since the early 1980s. "People don't need services six weeks after release. They need them immediately." Indeed, the study suggests that the post-prison-release period may be key in the fight to eliminate new transmissions of HIV, says Dr. Cato T. Laurencin, a professor at the University of Connecticut and founding editor of the Journal of Racial and Ethnic Health Disparities, who was not involved in the study. "We are now talking about the fact that we believe that we can end new cases of HIV in our lifetime," Laurencin says. "We need to see changes in this setting. And if we're not, that tells us we're not on course." One in 6 people living with HIV is incarcerated at any one time, according to a 2009 study. The good news is that these people often get treatment behind bars. Some studies show 71 percent of people leave prison with HIV that is so well-controlled, it is undetectable with current tests. The bad news is that once people leave prison, engagement in care and associated HIV viral control drops precipitously, as the study shows. Indeed, one year after leaving prison, among the 1,094 study participants, only 67.2 percent were still in care. The following year, that number dropped to 51.3 percent. By the end of the third year, only 42.5 percent were still in care. That's for everyone in the study. When researchers teased out people who were re-incarcerated from those who weren't, retention was higher; 48 percent of the re-incarcerated had care, while 34 percent of those living outside did. But fully controlled HIV was more common in the people on the outside, the study showed. "This is the paradox," says Altice. 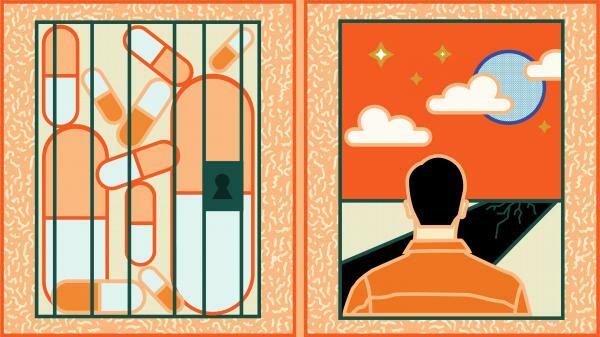 "People who are re-incarcerated didn't have good viral suppression. It's much better for health [to stay out of prison]." So what made the difference? When the researchers looked at what differentiated the people who stayed in care from those who didn't, a few things stood out. People with health insurance were more than twice as likely to achieve viral suppression as those without. Second, those with access to intensive case management — services that can connect people to support groups, drug treatment programs, housing and other services — were twice as likely to still be virally suppressed at the end of three years as those without it. Even those who received only five case management visits were still 69 percent more likely to be virally suppressed at the end of the study. One limitation of the study, says Dr. David Wohl, co-director of HIV services at the North Carolina Department of Corrections and professor of medicine at the University of North Carolina, is that it's hard to generalize the findings in one state, an urban one like Connecticut, nationally. "This is a best-case scenario," says Wohl. "The services described in this paper don't exist in North Carolina." Indeed, like many Northern states, Connecticut expanded Medicaid. And it is among 16 states that have changed their rules to suspend rather than cancel Medicaid when people enter prison. Many states cancel Medicaid enrollment, requiring recently incarcerated people to navigate reapplying. Other states have extremely limited eligibility for Medicaid that might exclude adults without disabilities. "This also tells me something else," says Altice. "This should be a group targeted for Medicaid expansion." For the University of Connecticut's Laurencin, those interventions could start to ameliorate the impact of HIV on communities of color. Seventy-eight percent of the people in the study were black or Latino. Only 1 in 3 of them stayed in care. As HIV becomes more concentrated in communities of color while effective treatment and prevention more often go to white, middle-class Americans, this study should signal an "all hands on deck" approach to helping this group of people, says Laurencin. Kelsey B. Loeliger, Ph.D., a medical student at Yale School of Medicine and lead investigator of the Yale study, concurred. And all the study authors, as well as Wohl, made some variation of this statement as well: Maybe we should look at locking up fewer people. "Prison reform is needed in so many ways," Loeliger says. "So much is needed across the board for this population. If you come at it from a strict medication-adherence standpoint, that's such a small piece of the puzzle." When Bryan C. Jones walked out of an Ohio penitentiary in 2008, he did so with two weeks of HIV medications, a virus that had grown resistant to those drugs, and an immune system that was shutting down. He was sick and he knew his meds weren't working. So when he boarded the Greyhound back to Cleveland, he left the pills in a trash can in the one-room storefront bus station. "I knew I was resistant to those meds they gave me," Jones, now 58, says. "And I knew that prison didn't give me anything to further my acceptance of living with HIV. No one [knew] my status. [And] I [wasn't going to] walk around with meds. It just didn't make sense to me." But Jones was one of the lucky ones. A few weeks after his release, he returned to his old HIV doctor, paid for with Ryan White Care Act funds while he waited for his Medicaid to be approved. His doctor put him back on a regimen that worked a little better. Jones started educating himself on the virus and his options. He started telling people he had HIV. A case manager connected him to permanent housing. That "made all the difference," Jones recalls. "It was a place I could freely take my meds and not have to worry about people seeing it in the fridge or having to dig it out of a drawer." He also stayed in substance abuse treatment. Then a new medication came out that his virus wasn't resistant to. Now, a decade later, Jones is still a regular at his doctor's office. He started bringing HIV support groups to the penitentiary where he had been housed. He runs another support group and advocates for himself and his friends. His HIV is so well-controlled on a newer drug combination that his doctor hasn't been able to detect it in his blood for six years. In the process, he found a greater purpose. "See, care can't keep you in care," he says. "You've got to have something else. That's the tie that binds." Heather Boerner is a health and science reporter based in Pittsburgh.